Want to connect with Luis? 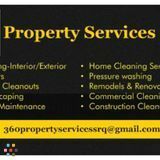 360 Property Services LLC. Offers a variety of quality services to maintain your property. 360 is a family owned business proudly serving Sarasota. Give us a call anytime fir a free in home estimate. We are fully insured and bonded for yourprotection.